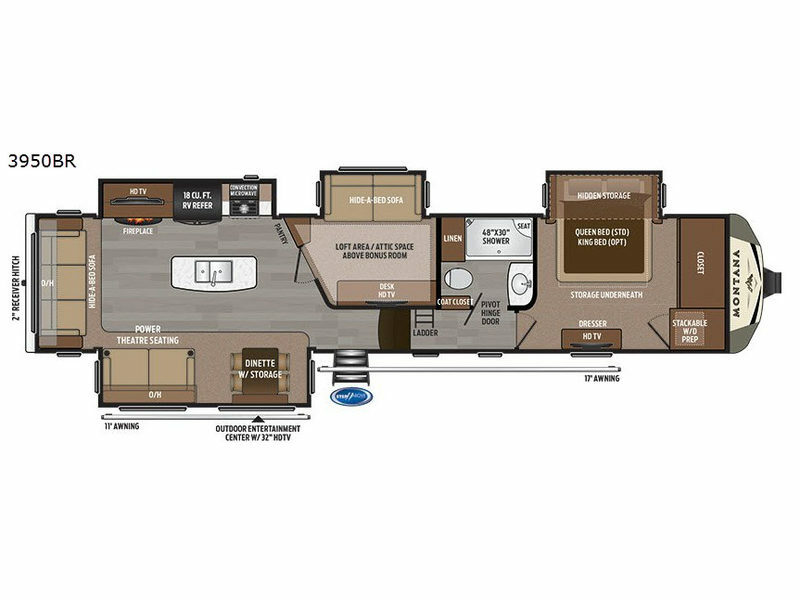 Imagine you are hiking on your favorite trail then returning to a spacious fifth wheel with four slide outs and a bonus room. This Montana 3950BR might just fit into your imagination and your work schedule. The bonus room can be utilized as a living area, bedroom, or even an office. You will find a hide-a-bed sofa slide out, and a desk. Above the room there is a loft area that you can use as extra sleeping space or as an attic for storage. The rear living, kitchen, and entertaining area offers plenty of seating including theatre seats with power recliners in case you want to sneak in a nap. The kitchen includes an 18 cu. ft. RV refrigerator, a pantry, and the appliances needed to make meals for everyone. Be sure to enjoy the outside features as well. There is an entertainment center with a 32" HDTV and two awnings when you want additional living space in the great outdoors, plus exterior storage and more. When packing for your next trip in a Keystone Montana luxury fifth wheel you will appreciate the enormous drop frame pass-through storage compartment, MORyde "Step Above" entry steps with strut, and flush mounted LED interior lights to name a few features. Inside you will find an iRelax high density mattress for a good night's sleep, plus a Furrion RV Chef collection oven with auto-ignite and a convection/microwave oven for making your favorite meals. It's time to find the luxury fifth wheel you can enjoy for years to come, choose a Montana by Keystone today!